As Summer rapidly approaches, many people are dreaming of vacation, summer camp, or just relaxing at the pool. Whatever your summer plans may involve, we’re here to help make them that much more memorable for you and your children; and, the best part: it won’t cost a penny (besides the gas it might take to get you there). We reached out to some of the top playground equipment manufacturers, consultants, and designers, to ask them what their favorite playgrounds of the year are and based on their feedback we’ve compiled a list of the 15 favorite playgrounds of 2015. It would be truly impossible to actually rate them in any order as each of them are unique and amazing in their own way. We have, however, tried to sort them by characteristics that makes them extra special. Dubbed as “Cincinnati’s Most Creative Children’s Playground“, this amazing and unusual playground by Landscape Structures, is definitely worth a visit. The large play structure looks almost like a giant fishing net thrown out to catch the little children. Older kids can challenge themselves as they climb through the cargo net tunnel and obstacle course-like structure. This colorful, almost Dr. Seuss-like playground will truly bring tots up to teens together to play. It’s challenging enough for older kids yet gentle enough for younger toddlers (padded play surface). From the moment children walk through the entrance and are greeted by the motion-activated hollow log gateway, they will be blown away by all that they see. Slide down the 20ft slide inside the working windmill (or even the 35ft slide built into the embankment); follow the walkway and interact with a joking gnome, crawling critters, rabbit talk tubes, and a Rastafarian frog drum; climb through a hollowed out tree; run across the piano bridge (like from the movie “Big”); and, cool off in the misting cattails during the summer months. And, there’s so much more that you just have to visit it yourself. Woodland Wonderland is essentially brand new, so explore it while it’s still a somewhat hidden treasure because it’s too great to remain a secret for long! I’m honestly not sure how someone can get more creative than this! 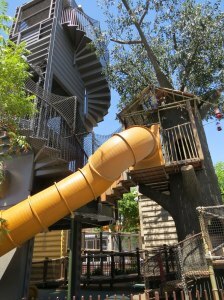 Cre8Play literally turned a giant shipping container into a massive, metal treehouse with a fully interactive slide. Say what? Yes! According to Cre8Play, “energy-saving sensors in the tube slide are triggered to activate cosmic, starship, hyper-drive and fish tank visual displays as well as a sonic boom and blast of air.” Uhhhh….yeah…amazing! Now I actually want to take my kids to Vegas….never thought I’d say that! 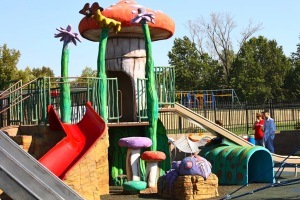 Once you look beyond the stimulating colors and GameTime playground equipment, you will begin to see the educational elements that G.E Fielder & Associates, Chartered wove into every area of this playground. Children can learn about the colors of the rainbow (ROYGBIV) and the color wheel. Budding mathematicians can practice counting numbers as they wander around the playground. History buffs can learn interesting transportation facts, and everyone can practice memorizing the states all in the context of fun and play. While this playground could have easily been one of our top accessible playgrounds, as over 90% of it is accessible to children with disabilities, we instead chose to place it in this category because of how creatively Landscape Structures has interwoven the area’s past into the present. According to Landscape Structures, the playground takes a “step back in time with its thematic nod to its origins as an auto tourist camp. It also takes a giant step forward as the first inclusive playground within the city’s parks system.” In essence, they have created a timeless memorial that children can play on and enjoy for years to come. In keeping with the tribute to the past, Landscape Structures once again did a wonderful job of acknowledging Rapid City’s rich history through its playground design. Remembrance and renewal are the themes at this park with features that point to the city’s past like the 1972 flood. 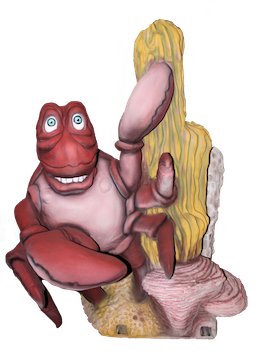 Also built into the nature-themed play structures are fossils of all sorts since this area is well-known among Archeologists. In fact, in keeping with the idea of discovery, there are 70 images of fossils, animals and plants hidden throughout the park. Kids can work together with each other to find all the hidden items. All-inclusive playgrounds are specifically designed to allow children of all abilities to play together. It is more than just getting children with special needs to the play equipment, it is about providing them opportunities to actually play interactively with other children on the equipment. Each of the following playgrounds have gone above and beyond in this area. Talk about a creative way to bring an exciting and stimulating playground to children of all abilities! This collaborative effort among Unlimited Play, Cre8Play, and Cunningham Recreation is a true favorite for all children. 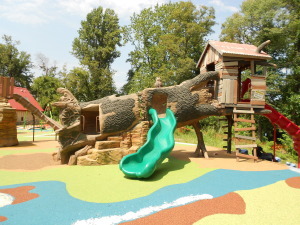 This playground opened in Westoff Park on October 1, 2011. The playground was named after a nine-year-old boy Brendan Schmitt, a Westoff Elementary School student who suffers from Thompson Syndrome, a rare genetic disease that makes it difficult for him to use traditional playground equipment. One of Cr8Play‘s favorite playgrounds features their signature creative stamp in an all-inclusive environment. 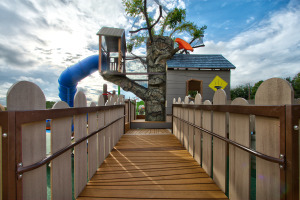 There is a unique, wheel-chair accessible, ginormous treehouse; misting dolphins; a zip line; custom characters; interactive sound and game panels; and so much more. Included in the accessible design are slides built specifically to not zap cochlear devices and a cozy cocoon for children with autism. Another of Cunningham Recreation‘s favorite playgrounds this year is Des Moines’ first all-inclusive playground which caters to kids with special needs. What truly makes this wonderful playground so great is not just the fact that it’s accessible to all, but also the story behind the fundraising that went into building this great play environment. Using GameTime play equipment and named in honor of Ashley Okland’s legacy, Variety spent two years raising the needed funds for this project. With a goal of $500,000 Variety surpassed its goal putting the remaining funds towards a shelter for families near the playground. It is not altogether surprising that this is far and away the most popular playground on our website. It was one of the first that I reviewed while we were living there and JBLM is also the 4th largest military installation in the world. This playground is centrally located close to all your shopping needs on Post and in the summer, the playground and splash park are a great place to cool off while burning energy at the same time. Sometimes, it’s not about the uniqueness or size of a playground that makes it popular. Often, it’s about its location. Occasionally, parents just need to find the playground/play area that’s closest to them right now and the play area at Seattle Tacoma International airport has proven that parents don’t just like the idea of a play area in an airport. They NEED it! With thousands of viewers visiting this review on our website, making it the 3rd most popular play area on our website, it’s pretty clear that parents really do LOVE being able to let their kids play when traveling through airports. Just a FYI: DTW airport play area is the 5th most popular playground/play area on our website and MSP’s play area is the 8th most popular. Is it because of the upcoming US Open being played here this summer that this playground is so popular? Perhaps. But, it has always been a personal favorite because you can take in the beautiful views of the Puget Sound while enjoying this wonderful fortress playground. I fell in love with this playground before I ever laid eyes on it and once I saw it in person I was not disappointed. Apparently, everyone else loves this playground, too, because it gets a ton of views on the website and a load of visitors on the weekends! Nestled within the gorgeous Washington Park, this large, accessible playground is fun and peaceful. It’s a great place to escape from the city (though you’re still in the heart of Portland) and enjoy the beauty of the nature all around you. This is truly a gem of a playground and a popular one with our viewers. Now that you’ve had the opportunity to see our top picks of the year, take some time to share your favorite playground with us! We would love to add it to next year’s list!